Sri Lankan Malay man and child, 19th century. Sri Lankan Malays (also known in Sinhalese language as Ja Minissu meaning Javanese (Sinhala: ශ්‍රී ලාංකා මැලේ; Tamil: இலங்கை மலாய்) – a catch-all term historically used for all natives of the Malay Archipelago – are ethnic Malays who reside in Sri Lanka. They number approximately 40,000, and make up 0.20% of the Sri Lankan population. 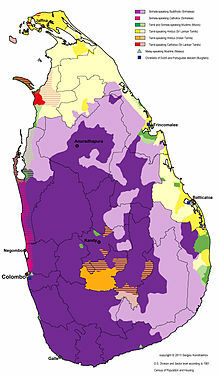 Sri Lankan Malays first settled in the country when both Sri Lanka and Indonesia were Dutch colonies, i.e. during Dutch Ceylon, while a second wave (1796–1948) came from the Malay Peninsula, when both Malaya and Sri Lanka were in the British Empire. Significant Malay presence in Sri Lanka dated as early as 13th century, when Chandrabhanu Sridhamaraja, a Malay of Tambralinga managed to occupy northern part of the island in 1247, nonetheless the followers of Chandrabhanu would mostly assimilate to the local population. Many of the ancestors of present-day Sri Lankan Malays coming from soldiers posted by the Dutch which later continued by the British for colonial administration to Sri Lanka, who decided to settle on the island. Other immigrants were convicts or members of noble houses from Dutch East Indies (present day Indonesia) who were exiled to Sri Lanka and who never left. The main source of a continuing Malay identity is their common Malay language, the Islamic faith and their ancestral origin from the Malay Archipelago. Many Sri Lankan Malays have been celebrated as courageous soldiers, politicians, sportsmen, lawyers, accountants and doctors. Depending on where they live in the country and other socio-economic factors Sri Lankan Malays speak Sinhala, Tamil and / or English. According to the 2012 Census 79.2% or 28,975 Sri Lankan Malays also spoke Tamil and 66.2% or 24,202 Sri Lankan Malays also spoke English. Like their ancestors in present-day Indonesia and Malaysia, Sri Lankan Malays are Muslim. Mosques were erected by the local Malays along the coasts of Sri Lanka in places like Hambantota, Beruwela, and Galle. The Jawatte mosque in Colombo and Masjidul Jamiya, the military mosque in Slave Island, are acclaimed mosques renowned for their architecture and long history. The first two storey of the Grand Mosque in Sri Lanka was built by HH Mohammed Balankaya, an exiled Malay noble of the Royal House of Gowa (in present-day Sulawesi, Indonesia). Today the mosque is of great significance and is a symbol of Muslims in Sri Lanka and is the Grand Mosque of Sri Lanka where decisions made here affect the lives of the island's Muslim population. ^ "A2 : Population by ethnic group according to districts, 2012". Census of Population & Housing, 2011. Department of Census & Statistics, Sri Lanka. ^ "Population by ethnic group, census years" (PDF). Department of Census & Statistics, Sri Lanka. Archived from the original (PDF) on 13 November 2011. Retrieved 23 October 2012. ^ "Census of Population and Housing 2011". www.statistics.gov.lk. Department of Census and Statistics. Retrieved 14 November 2018. ^ B. D. K. Saldin (1996). Orang Melayu Sri Lanka Dan Bahasanya. Sridevi Printers Publication. p. 17. ISBN 95-594-1902-1. ^ DK (2016). DK Eyewitness Travel Guide Sri Lanka. Dorling Kindersley Ltd. p. 69. ISBN 02-412-8997-1. Wikimedia Commons has media related to Sri Lankan Malay people. This page was last edited on 4 April 2019, at 11:28 (UTC).